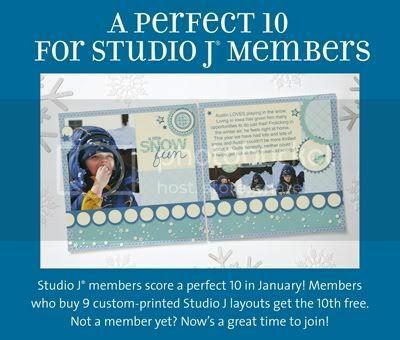 January is free layout month for StudioJ® members! For every 9 custom-printed Studio J layouts you buy, you’ll receive the 10th layout free. To receive the discount, just add 10 or more layouts to your cart. You’ll see a discount reflected in your order total. And you can totally take advantage of this promotion by ordering in multiples of 10. Buy 9, get 1 free. Buy 18, get 2 free. Buy 27, get 3 free. And so on! Ifyou’re not a member yet, now’s a great time to join!